This week, end-of-life care discussions joined the political debate over health care reform. What started out as legislative proposals to finance optional end-of-life care consultations between doctors and patients morphed into governmental bodies (so-called "death panels") that would decide which dying patients would and would not receive care based on cost-cutting measures. False assertions and rumors resulted in debates so ferocious that even well-seasoned health care advocates were taken aback. As someone who has written an entire book about the difficulties of caring well for the dying, I find all the fury aimed at halting support of end-of-life care discussions more than a little ironic. Why? Because the truth is that most of us need all the help we can get to start these difficult conversations. The truth is that we never talk or even want to think about talking about dying because we are afraid of dashing the hopes of our loved ones or our patients. The truth is that we fear -- even abhor -- these discussions because we believe that by talking about dying we are giving up. Yet all of those imagined fears could not be farther from the reality of end-of-life care discussions. At least according to some of the best research on the impact of these conversations on patients and their loved ones. In this week's "Doctor and Patient" column, I speak with Dr. Holly Prigerson, one of the country's leading researchers on end-of-life care discussions, and ask her about the significant and enduring effects of these conversations on patients and their families. Have you, as a patient, friend, family member or doctor, participated in end-of-life care discussions? Were they difficult? Did they make a difference? And do you believe they should be supported in legislative proposals for health care reform? Please leave your comments below or in Tara Parker-Pope's "Well" blog. Are Patients in Part to Blame When Doctors Miss the Diagnosis? This week in "Doctor and Patient," I write about an increasingly popular topic of research in patient safety: diagnostic failures, or diagnoses that are delayed or in error. While some researchers have focused on the role of doctors -- are there flaws in the way they think? Are gut reactions reliable? -- others have looked at the steps involved in care. What has emerged most recently from this latter group of studies is that diagnostic failures are often due to missed steps, so-called "process of care lapses," that stem from both doctors and patients. Have you, as a patient, doctor, or both, experienced a process of care lapse that led to a missed or late diagnosis? Who is ultimately responsible for diagnostic failures and how can we decrease them? Please leave your comments below or in Tara Parker-Pope's "Well" blog. Informed consent is an integral part of a physician's practice. But for years, I, like most physicians, bumbled through the process, learning by trial and error. I'd like to believe that over time I've gotten better at obtaining consent, but occasionally I'll recall awkward experiences and cringe at the memory. This week, a study published in the current issue of Academic Medicine made me reflect again on the process of informed consent. Researchers at the Cleveland Clinic found that after a single day-long training session, doctors were better at eliciting questions and clarifying comments than doctors who had not been trained. In this week's "Doctor and Patient" column, I write about the process of informed consent and how it can strengthen the patient-doctor relationship. How has informed consent affected your relationship with doctors or patients? Can we or should we approach the process differently? Please leave your comments below or on Tara Parker-Pope's "Well" blog. Apologies for the dearth of posts lately! In this week's "Doctor and Patient" column, I look at the economic argument for preventive care. Whenever I see a patient, questions scroll down my mind's eye like credits at the end of a movie. Some of the questions I ask are generic: What brings you here today? What medications are you taking? Some are specialized: Was your liver transplant done "piggy back"? Have you had any episodes of rejection? But a few of the questions have nothing to do with the work I do or the care I am trained to offer. Rather, they are questions about being well and preventing disease: Are you exercising? Do you smoke? Have you had a mammogram? For years I believed that asking questions about a patient's health behaviors or about screening tests was like doing a good deed. The discussion could help a patient avoid preventable diseases and could potentially contribute to the greater public good by saving money and health care resources. But it turns out that at least one of my assumptions about preventive medicine -- that it could help save money – was erroneous. Sort of. Most data shows that preventive medicine does not save money. But in a recent Journal of the American Medical Association commentary, Dr. Steven H. Woolf, a professor of family medicine at Virginia Commonwealth University in Richmond, VA, and a leading expert in preventive medicine, argues that we should not be evaluating preventive interventions by how much money is saved. Instead, we need to look at the value gained for each dollar we spend. In this week's "Doctor and Patient" column, I write about these issues and interview Dr. Woolf. Do you think preventive medicine is important? Or do savings trump value? Please leave your comments below or at Tara Parker-Pope's "Well" blog. I blog, I tweet, and I use Facebook. I find social media to be an enormously useful tool in my work. But when I mentioned this to a medical colleague of mine, he replied, "I can barely keep up with email. I'm not about to open up that black box." More than 60% of adults now go online for health-related information, and a majority of those individuals access social media platforms. Nonetheless, there are only a handful of articles in peer-reviewed journals and no evidence-based guidelines for clinicians to use when it comes to social media. For example, should a doctor diagnose or prescribe on Facebook or a blog? Is a doctor liable if she or he misses a patient's tweets about the acute onset of shortness of breath? In this week's "Doctor and Patient" column, I explore social media and the patient-doctor relationship. How should doctors and patients use blogs, twitter, and Facebook, if at all? And do they strengthen the therapeutic relationship or detract from it? Please leave your comments below or at Tara Parker-Pope's "Well" blog. I would like to believe that the care I give patients is patient-centered. But two weeks ago, Dr. Donald M. Berwick made me wonder if I could do more. In this week's "Doctor and Patient," I interview Dr. Berwick. How do you define "patient-centered care"? Please leave your comments below or on Tara Parker-Pope's "Well" blog. 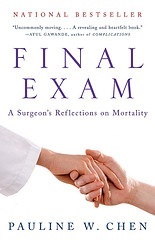 I have spent a lot of time in the last few years thinking, writing and speaking about end-of-life care. But it all became very personal recently. My mother-in-law died two weeks ago. With a designer's flair and a dazzling memory, my mother-in-law looked like Donna Reed in her youth, with Rita Hayworth legs. She adored her family and friends and loved nothing more than to be where the "action" was, in the midst of conversation and laughter. Over the course of her 86 years, she counted hundreds among her friends. Hundreds. When one of her sons died some forty years ago, she and my father-in-law received over six hundred condolence letters. In the last year, however, my mother-in-law saw her once vibrant social life whither away. Severely debilitated by a lifelong battle with rheumatoid arthritis, a 10-year struggle with a series of strokes, and, more recently, multiple non-healing leg ulcers that necessitated an above-the-knee amputation, my mother-in-law found herself wheelchair-bound and restricted by all the medical equipment she required. But her last weeks and her death fourteen days ago ultimately reflected the life that she loved. She threw a party with my sister-in-law's help. She was surrounded during her waking hours by family and new friends. And she was, as I heard her whisper one day, "so very happy." What made all of this possible were a series of conversations, conversations initiated by doctors and nurses about end-of-life care. There was the conversation a couple of months ago where we learned that my mother-in-law was dying and would benefit from hospice. And there were the many daily conversations about what my mother-in-law desired and what she did not. Her experience reminded me of a study that came out last fall in The Journal of the American Medical Association. Dr. Alexi White and her co-investigators showed that end-of-life care discussions with the terminally ill not only improved the quality of life of the dying but also eased the grief of their survivors. I interview Dr. White in this week's "Doctor and Patient" column, and I write about my mother-in-law's experience and the effect of these kinds of conversation on my family. What are your experiences with end-of-life care discussions as a clinician, a patient, or a family member? Please leave your comments below or on Tara Parker-Pope's "Well" blog. "Doctoring," a senior physician once commented during rounds, "brings out the mother in all of us." At first the other doctors-in-training and I laughed at his remark. The comparison between our mothers and the highly trained professionals we wanted so much to be seemed humorous. But our laughter quickly abated. We knew that there was indeed some similarity between the duties we had as doctors and the responsibilities our mothers bore. And, for at least a few of us on rounds that afternoon, it was not clear how we would or could manage both. In this week's "Doctor and Patient" column, I write about balancing work and family responsibilities. Is it different for women who are doctors? And does each role affect the other? Please leave your thoughts on this topic either below or on Tara Parker-Pope's "Well" blog. Earlier this week, a friend asked me how aspiring surgeons learn to cut. She couldn’t imagine ever putting a knife to someone else’s flesh. I’ve spent a lot of time since that discussion thinking about my response. Like others in this country, I read about the recently declassified contents of four memos that describe brutal interrogation techniques condoned by the Bush Administration and carried out by the Central Intelligence Agency. But as horrified as I was by the content in these 100-plus pages, what continues to haunt me are the descriptions of the individuals responsible. Many of them seem like ordinary professionals. Some appear to be not all that different from, well, me. Can anyone become habituated to the horrific? I explore this question in this week's "Doctor and Patient" column, and I’d love to read your comments, either below or on Tara Parker-Pope’s “Well” blog. Tonight and next Tuesday, PBS (Nova) airs the fifth and final installment of "Doctors' Diaries," the 22-year chronicle of the lives of seven Harvard Medical School students. It's a moving documentary, tinged with the nostalgia and sadness that comes with nearly perfect 20/20 hindsight. But it is also hopeful. Each of the seven, while transcending a range of personal challenges, ultimately becomes the kind of physician any one of us would like to have. And, even more poignantly, they become the kind of caring doctors they had always hoped to be. "Doctor and Patient: A New Chance to Strengthen an Eroding Bond" in the New York Times print and online, 30 March 2010. "Doctor and Patient: When is the Worse Time to Go to the Hospital?" in The New York Times online, 18 March 2010. "Doctor and Patient: Learning to Keep Patients Safe in a Culture of Fear" in The New York Times online, 11 March 2010. "Doctor and Patient: The Doctor's Failure to Cut Costs" in The New York Times online, 4 March 2011. "Doctor and Patient: Discovering Teenagers' Risky 'Game' Too Late" in The New York Times online, 25 February 2010. "Doctor and Patient: When the Patient Can't Afford the Care" in the New York Times online, 4 February 2010. "Doctor and Patient: Practicing on Patients, Real and Otherwise" in the New York Times online, 28 January 2010. "Doctor and Patient: Offering Care for the Caregiver" in the New York Times online, 21 January 2010. "Doctor and Patient: Do You Have the 'Right Stuff' to Be a Doctor?" in the New York Times online, 14 January 2010. "Doctor and Patient: Are Doctors Ready for Virtual Visits?" in The New York Times online, 7 January 2010.